What are the concerns and consequences of an overweight landing? If a 777 ER has to immediately land after takeoff on a planned 14,594 km trip (in the case of a fire, e.g. ), the landing will be executed with a very heavy aircraft. What are the major concerns of doing such a landing? What will, on average, be the consequences of this overweight landing? Deceleration distance: The higher mass requires a higher approach and touch down speed (higher by the square root of the mass ratio between your actual mass and the maximum certified landing mass). Now you have more mass and more speed, but the landing strip and the airliner's brakes are still the same. The risk is that you overshoot the runway with an airplane full of fuel or that you overheat the brakes (which will result in their failure, and again an overshoot). Since the kinetic energy is proportional to mass times speed squared, the energy which needs to be absorbed by the brake goes up with the square of the mass increase. If the selected runway for your overweight landing is long enough and the weather is calm (so a smooth landing is easier), an overweight landing is not such a problem. Now let's look at the 777-300ER in detail. I use the figures from Wikipedia, because the manufacturer's site is trying much harder to hide the relevant data. The MTOW (maximum take-off weight, which is actually a mass) is 351,534 kg, and the maximum landing weight is 251,290 kg, about 100 tons less. Now let's assume that taking off and returning to the airfield uses 5 tons of fuel, so the mass ratio is 1.379. Therefore, the approach speed has to be 17.4% higher and the total kinetic energy at touchdown is higher by a factor of 1.9 compared to the case at maximum allowable landing weight. If we now assume that speed is reduced linearly during the landing run and that the wheel brakes will just absorb as much energy over time as in the case at maximum landing weight, the deceleration needs to be lower by the mass ratio, so the aircraft decelerates with only 72.5% of the deceleration at maximum landing weight. To shed its kinetic energy, the landing run will take longer by the increase in kinetic energy, i.e. 1.9. Since the average speed is also higher by 17.4%, the landing distance will be higher by a factor of 2.233 or 223% of the landing distance at maximum landing weight. This neglects that the heating of the brakes is an instationary process, so you cannot simply brake with the same intensity for more than twice the time they were designed for. But this little estimation should illuminate what impact a higher landing mass has on the energy and distance involved. The major issue with landing a plane that is overweight is over-running the runway. If you are trying to land a plane that is over it's rated landing weight, you will need to be going faster to keep enough airflow over the wings to generate the lift required to keep the plane in the air. 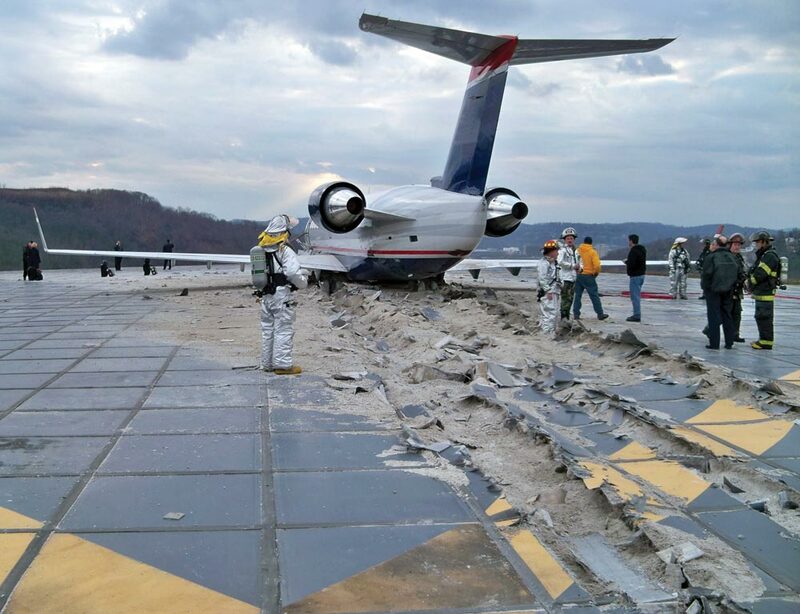 This, of course, has the consequence that it will take longer to stop when on the runway. So not only are we now landing with a higher mass (m) we are also landing with a higher speed (v) so our momentum increases very quickly. you can see that even a small increase in speed causes the momentum to increase significantly. The other issue is the load put on the landing gear which have the potential damage them, although I think that the deceleration speed is the bigger factor here. EDIT: One other thing I forgot to mention was that most larger airports have a special kind of surface at the end of the runway that serve to slow planes. They are constructed (iirc) out of some sort of very strong foam like material that is very effective at slowing a plane. I don't remember exactly what it was made out of though. As mentioned by NoviceInDisguise and ChrisW, this is actually called the Engineered materials arrestor system and is made out of lightweight, crushable concrete blocks. An overweight landing is defined as a landing made at a gross weight in excess of the maximum design (i.e., structural) landing weight for a particular model. There has been no adverse service experience with airplanes certificated under Part 25 involved in overweight landings. Loads on the Landing Gear The touchdown rates are higher in case of overweight landings. Touchdown at higher-than-normal sink rates may result in structural limits being exceeded. However, unless the pilot does a very hard landing, this should not be a problem. This is because regulatory requirements for landing gear design are based on a sink rate of 6 feet per second at the maximum design takeoff weight, while the usual sink rate is nearly half of that. Also, the wheel, brake and tire design is based on the most severe landing stop conditions at maximum wear out or a rejected landing at maximum take off weight, whichever is worse. Landing Field Length This becomes an issue only when the selected runway is smaller than the requirements. As the landing weight increases, the approach and touchdown speeds increases and the aircraft require more distance to decelerate. 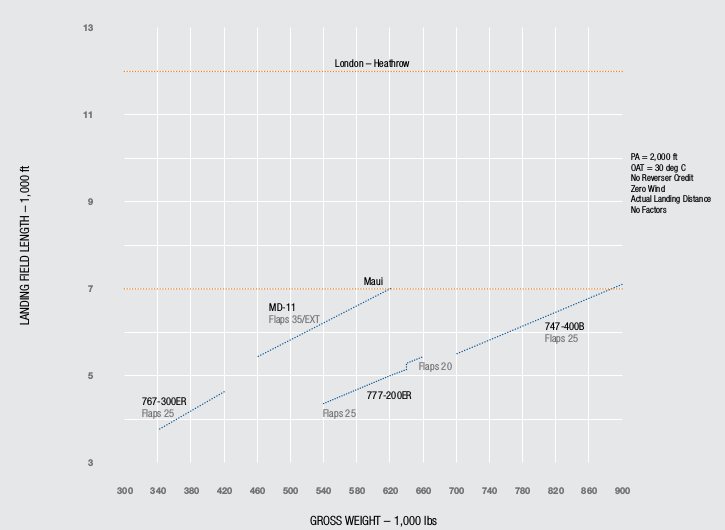 The landing length required is more as the weight increases and the aircraft field lengths are calculated for landing at MTOW. For example, for 777, according to Boeing, excess field length is available even for landing at MTOW. Performance Higher weight involves performance penalties as the control forces required are more. Control In most aircraft, for example in Boeings, the autopilot is not certified for overweight landings. Phase I The aircraft is inspected for obvious signs of structural distress, such as wrinkled skin, popped fasteners, or bent components in areas which are readily accessible. Phase II This is a much more detailed inspection required in case the Phase I inspection shows signs of excessive stress and requires opening access panels to examine critical structural components. In general, overweight landings should pose no problems as long as the landing is performed correctly. Not the answer you're looking for? Browse other questions tagged landing fuel weight or ask your own question. How is fuel dumped in aircraft? How much force does a 747 land with? Why safe take off weight exceeds the safe landing weight? What factors determine where an aircraft can dump fuel? What happens to incoming flights when the airport shuts down? A321 Two unsuccessful strong crosswind landing attempts. What was actually going on? What is the difference between landing weight and end-of-mission weight? What is the procedure when an aircraft with an emergency can't land due to a blocked runway? Why does ATC ask a crew who has declared an emergency if their aircraft will be overweight when landing? What is the purpose exactly of a ‘Control Check’? What qualifies as a “takeoff” and “landing” in currency requirements? What are the consequences of falsely and/or unnecessarily declaring an emergency? What does an absolute novice need to learn to make a successful emergency landing? How long will an aircraft need to fly before it can land without dumping fuel?